Organisational applications including supervision, coaching and leadership. Part I: Background. 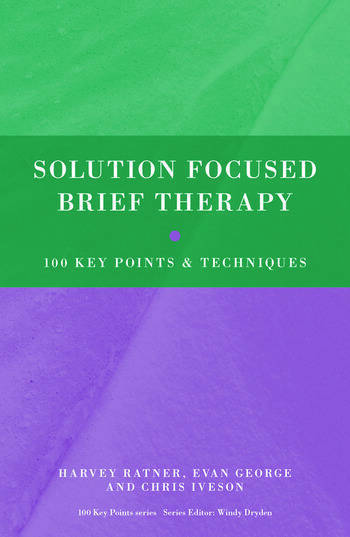 What is Solution Focused Brief Therapy (SFBT)? The Origins of SFBT (1): Milton Erickson. Origins (2): Family Therapy and the Brief Therapy Center at the Mental Research Institute in Palo Alto. Origins (3): The Brief Family Therapy Center (BFTC) in Milwaukee and the Birth of a New Approach. BFTC: The First Phase. BFTC: The Second Phase. SFBT Today. Philosophical Underpinnings: Constructivism. Philosophical Underpinnings: Wittgenstein, Language And Social Constructionism. Assumptions in SFBT. The Client-Therapist Relationship. The Evidence that SFBT Works. How Brief is Brief? Summary: The Structure of Solution Focused Sessions Part II: Features Of Solution Focused Interviewing. Ideas About Therapeutic Conversation. Choosing the Next Question. Acknowledgment and Possibility. Compliments. Deciding Who to Meet With Part III: Getting Started. Problem-Free Talk. Identifying Resources. Listening With a Constructive Ear: What The Client Can Do, Not What They Can’t. Constructive Histories. Pre-Meeting Change Part IV: Establishing A Contract. Finding Out the Client’s Best Hopes From the Work. The ‘Contract’: A Joint Project. The Difference Between Outcome and Process. The ‘Great Instead’. When the Client’s Hope is Beyond the Therapist’s Remit. When the Client Has Been Sent. Building a Contract With Young People. When the Client Says "Don’t Know". When the Client’s Hopes Appear To Be Unrealistic. What if There is a Situation of Risk? When The Practitioner is a Gatekeeper to a Resource. What if We Fail to Develop a Joint Project? Part V: The Client’s Preferred Future. Preferred Futures: The Tomorrow Question. Distant Futures. Qualities of Well-Described Futures: The Client’s Perspective. Qualities of Well-Described Futures: Other Person Perspectives. Broadening and Detailing Part VI: When Has it Already Happened? Instances of Success. Exceptions. Instances of the Future Already Happening. Lists. No Instances, No Exceptions Part VII: Measuring Progress: Using Scale Questions. Scale Questions: The Evaluation of Progress. Designating The ‘0’ on the Scale. Different Scales. Successes in the Past. What is Good Enough? Moving Up the Scale. Signs or Steps. What if the Client Says They are at ‘0’? When the Client’s Rating Seems Unrealistic Part VIII: Coping Questions: When Times Are Tough. Handling Difficult Situations, Including Bereavement. Stopping Things From Getting Worse. Part IX: Ending Sessions. Thinking Pause. Acknowledgments and Appreciations. Making Suggestions. Making the Next Appointment Part X: Conducting Follow Up Sessions. What Is Better? Amplifying the Progress Made. Strategy Questions. Identity Questions. When the Client Says Things Are the Same. When the Client Says Things Are Worse Part XI: Ending the Work. Maintaining Progress. What if There is No Progress? Part XII: Assessment and Safeguarding. Assessment. Safeguarding Part XIII: Children, Families, Schools and Groupwork. Children. Adolescents. Family Work. Scales in Family Work. Couples Work. in the School. Schools: Individual Work. Schools: The WOWW Project. Groupwork Part XIV: Work With Adults. Homelessness. Alzheimer’s. Clients With Learning Difficulties. Substance Misuse. Mental Health. Trauma and Abuse Part XV Supervision, Coaching and Organisational Applications. Supervision. Team Supervision. Coaching. Mentoring. Team Coaching. Leadership Part XVI Frequently Asked Questions. Isn’t it Just a Positive Approach? Isn’t it Just Papering Over the Cracks? It Doesn’t Deal With Emotions. Isn’t SFBT Just a Strengths-Based Approach? What Account Does it Take Of Culture? Isn’t it Just a Form of Problem-Solving? It’s a Formulaic Approach Can it be Used With Other Approaches? Self-Help SFBT.